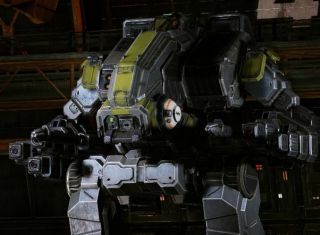 MechWarrior Online rolled out a vastly improved Mech Lab today, with changes to the mech loadout view, better access to upgrade information, and a new system for swapping parts that will greatly simplify the process of experimentation and customizing your favorite 70-ton ride. The debut of the new Mech Lab marks the completion of the second phase of the development of Community Warfare, the long-awaited part of the game that actually enables the Inner Sphere and the Clans to go head-to-head for control of the galaxy. The completion of phase two includes the addition of four major new maps, the addition of VoIP in all game modes, a "looking for group" option for individuals and groups, global faction chat, a "call to arms" feature that makes it faster and easier to assemble players to do battle over a contested planet, a new counter-attack mode, and "countless fixes to overall gameplay." But the behind-the-scenes changes are just as big. The Mech Lab now displays a mech's full weapons, ammo, and equipment loadout all at once, and Warehouse filtering has been improved so that it now only shows equipment relevant to the mech in question. Information about upgrades is more easily accessible and tied into weapons and ammunition requirements via a color coding system, while parts swapping is now a matter of simply dragging and dropping, rather than having to remove old parts before installing new ones. Naturally, there's a new trailer to mark the moment, and while it doesn't actually show the new Mech Lab in action, it does thrown down a lot of giant fighting robots blasting each other to smithereens with lasers, missiles, and PPCs. And let's be honest about it: That's what we're here for. More information about the latest round of changes to come to MechWarrior Online is up at mwomercs.com.